But what is proclaimed in the gospel tonight is what Christmas is all about, and we need to proclaim it loud and clear for all to hear. After all it is the third rule of the Code of Elves: “The best way to spread Christmas cheer, is singing loudly for all to hear.” Our Lord and Savior is born! Praise God! In tonight’s gospel from Luke, the shepherds see an angel with a multitude of the heavenly host praising God saying, “Glory to God in the highest and on earth peace to hose on whom is favor rests.” I’m thinking it was like the Mormon tabernacle choir times a thousand. Tonight’s gospel ends there, but the story continues. After this amazing concert and the angels return to heaven, the shepherds go to Bethlehem to see what all the commotion I about. 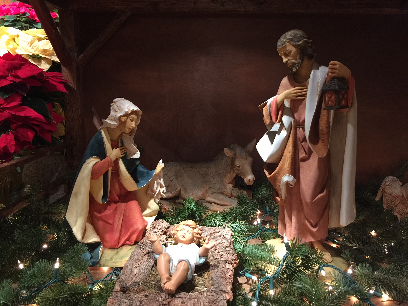 They hear about the Lord, go seek him out, find him, and then “they made known the message that had been told them about this child.” They shared the gift of the Lord with others. Our Lord and Savior is born! We must continue to share this gift with others, just as Linus does with Charlie Brown. You know that when Charles Schulz completed the Charlie Brown Christmas, he previewed the show to the executives from the network and Coca-Cola, the sponsors of the show. When the story got to the point where Linus proclaims the gospel story from Luke, the executives asked that that part of the story be removed. Charles Schulz said if the story of Jesus was removed the show would not go on television because Jesus is what Christmas is all about and so the story would not make sense without it. Our Lord came for all, that we might become children of God; from the lowly shepherds in the fields, to the kings that made their way from the east. He came for the saints of the world, like Mother Teresa and St. Francis of Assisi, and for the sinners of the world, that they might be transformed into saints. It’s like the second rule of the Code of Elves: “There is room for everyone on the nice list.” There is room for everyone in the family of God. We are all meant to be children of God. There is so much stress during the Christmas season and I think that it is because we get it all wrong. We try to do Christmas and try to make Christmas happen. We have parties and dinners. We bake and decorate. We shop. Charlie Brown tries to have a Christmas play. But Christmas is simply a gift, and gifts are simply received. We need to take time to simply receive the gift of our Lord this Christmas. It is a very special gift, like that very special doll, bike, train set, race track, or whatever that special gift you received as a child, for me an Atari 2600, except this gift doesn’t require batteries, is never broken, and it leads to so many other gifts. We must unwrap that treasured gift this Christmas and like all special gifts, share it with others. I mentioned all the rules of the Code of Elves, except the first one, and I think that it is the most important one, although it is only mentioned once in the movie Elf, and I think that it is because it is the hardest one: “Treat every day like Christmas.” How hard it is to treat every day like Christmas. How hard is to share good news, when there is so much bad news and fake news. How hard it is to be peaceful when there is so much war and violence. How hard it is to be loving, when there is so much hate and negativity. How hard it is to be joyful, when there is so much sadness in the world. This week I wrecked my car on Route 28 for $7850 of damage, but I am better off than those that will not have a job after the end of the year, and most of us are way better off than those we are praying for on the Holy Sepulcher prayer chain email list who have cancer, leukemia, and other life-threatening illnesses, have lost their homes or family members, or suffering through family issues, addictions, and other brokenness. In the light of all the problems, how do we make every day like Christmas? By making use of the gift of our Lord and Savior. After Christmas, many of the gifts we receive are put away, donated, forgotten, broken, or thrown away. But the gift of our Lord is meant to be used and shared. He transforms war into peace, hate into love, sadness into joy, and darkness into light. This Christmas unwrap this precious gift and share it with others, he will transform you, those with whom you share him, and the world itself will be transformed. Linus shared him with Charlie Brown and he was no longer sad and his Christmas was transformed. Christmas, the birth of our Lord and savior. We need to proclaim it loudly for all to hear, like the angels and shepherds, and like Linus, because our Lord came for all, from the lowly shepherds in the fields, to the kings that made their way from the east, to receive this gift and share this gift with others, because this gift is the gift of love, peace, and joy that the world so much needs right now. The gift of our Lord at Christmas. Our God came to us in the form of a child, lowly, meek, humble, and poor so that we could become children of God. He became one of us. He understands us. He knows what it is like for us, because he has lived it himself. Most importantly, he died on a cross so that we can receive the ultimate gift of everlasting life.